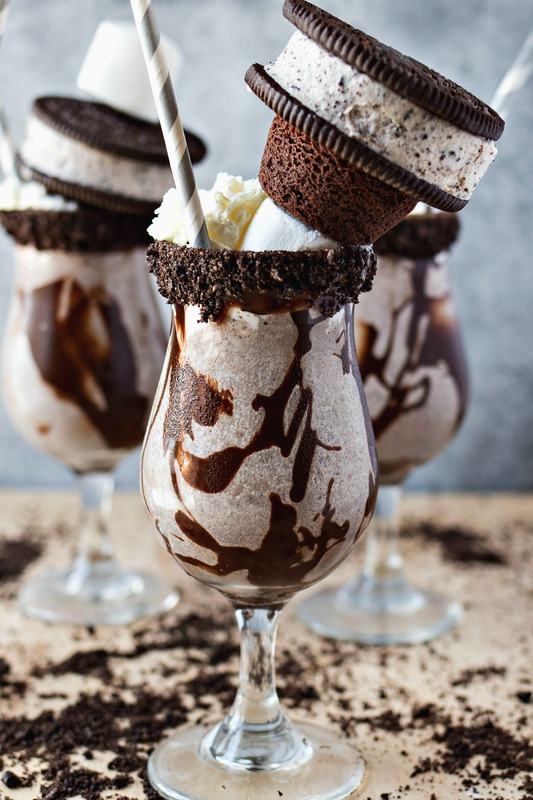 The Ultimate Cookies & Cream Milkshake – Your classic cookies & cream milkshake is taken up a notch with the addition of decadent garnishes like marshmallows, brownies, and ice cream sandwiches! You’re never gonna wanna go back to the boring regular shake again! Cookies & cream has been an OBSESSION of mine since I can remember. I even named my childhood cat after it! Well, we called her CC for short, or else she’d lose interest in what I was going to say before I even finished calling her full name. There was a time when I wouldn’t eat any other ice cream flavor. Don’t even ask – I’m having cookies & cream. My tastes have broadened a bit but my love for cookies & cream still stands strong. As I’ve matured, my ice cream tastes have shifted to a new love: milkshakes. And what kind of milkshake do you think I tried first??? Yup, a cookies & cream milkshake. It’s still a go-to of mine, though I do love a peanut butter milkshake every once in a while. Have you seen those insane milkshakes starting to pop up everywhere?? I think they first became famous at shops in NYC but they’ve spread all over, including Atlanta! There’s a place here that is known for their milkshakes with the most incredible garnishes, including brownies, doughnuts, and even slices of cake. Someone even put a freaking SLICE OF CAKE on top of a milkshake. This is America, folks. So for this milkshake, I decided I had to go big. But I didn’t want to go too big because that wasn’t realistic to me. Sure, when I’m out with friends, it’s fun to buy crazy drinks to share. But when you’re at home, do you really want to put a slice of cake on top of a milkshake? Not so much. It feels wrong and over-indulgent to make it for yourself. But hey, if someone else wants to make it, suddenly I don’t feel so bad. So that’s why I decided to make my ultimate milkshake in a normal size – 12 ounces – and keep the crazy garnishes proportional to that size. So no slices of cake here. But I still included fun stuff like marshmallows, brownies, a cookie crumble rim, and a full Oreo ice cream sandwich. Yup, I went there. Okay now that we’ve talked garnishes, let’s take a step back and focus on the milkshake itself. And that’s it. It’s a short list but you’ll be surprised to find that so many places get it wrong. It’s usually because their ice cream to cookie ratio is off. Not okay. So you better believe that, for these milkshakes, I had to get it right. When using the hot fudge for the rim, I recommend using it when it’s room temp. I used it when it was hot and it was too thin and caused the chocolate to run down the glass. But when using it to line the inside of the glass, you will need to warm the fudge a little so it can drizzle. I used a homemade hot fudge for this recipe. I just don’t like the taste of the store-bought stuff. If you want to make your own too, here’s the recipe I used from The Pioneer Woman. Don’t overfill the glasses with milkshake – otherwise the garnish will cause it to overflow. I filled mine with about 2 inches remaining. Then, I added whipped cream to the top and added the garnish. You can use whatever garnishes you want. I considered Ho-Hos, Zebra cakes, fudgy brownies, doughnut holes, and even full-sized doughnuts. I ultimately settled on the mini brownie, marshmallow, and ice cream sandwich. But use whatever speaks to you! And there you have it – you’re new favorite milkshake! Let me know what crazy garnishes you come up with for your creation! For those of you who entered the giveaway, I will be selecting a winner today and sending an email TODAY. So make sure to check your email!! Thank you for participating!! Your classic cookies & cream milkshake is taken up a notch with the addition of decadent garnishes like marshmallows, brownies, and ice cream sandwiches! You're never gonna wanna go back to the boring regular shake again! Prepare your serving glasses first. I recommend using small glasses (about 10-12 ounces). Dip the rim of each glass in the hot fudge and then cover in cookie crumbs. Place flat upside-down onto baking sheet to set. Repeat with other 3 glasses. Add shake ingredients to a blender and blend until smooth. Add a little fudge to the inside of the glass and then pour milk shake into each glass, leaving about 2 inches at the top. Fill the rest of the glass with whipped cream. Skewer garnishes on wooden skewer and place into shake. Add straw and enjoy! These look like absolute heaven! This looks amazing! Yes – i’ve been seeing all of those crazy, over-the-top milkshakes all over instagram. My husband loves cookies and cream, and we may have to give this a try! Yum! saving this to make soon!!! I love anything with oreos!! This looks incredible! Cookie nuggets are where it’s at. I’m totally making this with my kids in a few weeks when I’m off work for my summer vacation. YUMMY! This looks so good! I love anything oreo! This looks absolutely to die for!! This looks absolutely amazing. Not only does it look amazing, but it looks really simple too:) Thanks for sharing! This is so creative and fun! I’m a horrid baker but this looks like something that maybe I could whip up (maybe just not as pretty) and would be fun for my daughter. Exactly! This is a super simple recipe that even the most novice bakers can whip up! This is seriously the most amazing milkshake EVER!!! Yay! Glad this will be loved by the whole family! SOMEONE STOP ME FROM LICKING MY SCREEN. Wow this looks incredibly decadent. My husband likes to make milkshakes for us, but I think he needs to up his game because this look amazing! I got a sugar rush just looking at this. Look AMAZING! I want to try all of these! Your milkshakes are BEAUTIFUL! This is incredible, just pinned this and I was just like how happy I would be having this, it looks so beautiful and we all know it is delicious. Oh my gosh! I am absolutely drooling over this right now. My husband loves cookies and cream ice cream so I think he will LOVE this. I’m definitely a milkshake girl. Oh he sure will! You both will! Oh. My. Goodness! This looks absolutely beautiful and delicious. I will pin this for making later. My kids would have so much fun with this! Yay! Fun for the whole fam! Looks great – I could eat the cookies by themselves too! This looks absolutely AMAZING! Can’t wait to try! I would be the best mom in the world if I made this for my kiddies! lol. This shake is amazing!!! Cookie nuggets are everything! Pretty sure I gained 12 lbs just by looking at this post. This is an amazing recipe, will be pinning for an extra indulgent day. Just WOW! This milkshake looks insane!